I had lunch with Leslie in the early 1990s as she was preparing Stone Butch Blues for publication. Leslie was still formulating her ideas about personal pronouns, about writing, about movements and we discussed her book and the main character from a lesbian feminist perspective. (Please see her partner MinnieBruce Pratt’s discussion of Leslie’s pronoun preference on FB.) Leslie was making her first foray into publishing and my first novel had just come out so she wanted to get a sense of the writing community and Firebrand Books which became her publisher as well as mine. I wanted to know more about Transgender politics and growing up in Buffalo. Leslie was soft spoken, charming, energetic, sharp as a tack and threaded deep with both the political education she’d absorbed and the spiritual world that gave her comfort. We talked about the book and how radical it would be, neither of us raising the idea that it would give form and fire to a movement. It was more of a ‘how to get into bookstores, how to do readings’ framework but always the spiritual was woven through the conversation. I was moved by that. I thought of Leslie a lot this past September when I was addressing a group in Seattle, LGBTQ Allyship , at its Intergenerational Conference. The group was created to organize for social and economic justice and had held a series of intergenerational meetings over the summer that culminated in the one day conference. I was the co-keynote speaker with young, Trans poet Nic Masangkay. The conference and the room where we spoke was full of the rainbow we always imagine…Philipino/a, White, African American, Chinese, Latino/a. And the generations: a frail, 80 year old man who still worked as a volunteer, the popular, early transgender activist with whom I reminisced about queer clubs in Boston in the 1970s; the youthful women and men still in college, still deciding which pronoun was theirs and the white haired lesbian feminists (like myself) who were trying to clarify the path. LGBTQ Allyship has set an imposing task for itself: to work within the Queer community and with other marginalized communities to educate, organize and engage so people feel that their economic lives and social freedoms are in their own hands. They insist that we look at the oppression we each experience in our own individual ways and find our commonality. They made a strong start by pulling off the inspiring conference and continue plans for upcoming local events. They’ve created a dynamic model for local community organizing that should be useful for others trying to figure out a way to pull all the energy together that seems to sprawl in dormancy around us. It felt like the wild organizing days of the 1970s again! As I looked around the conference I thought of Leslie and all the work she’d done as a Lesbian Feminist, as a Socialist, as an anti-racist and pro-choice activist, as a Transgender activist, as a Transperson to bring us all together in this one place in this one time. There is often much bitter discord between the initials in our Queer movement—When is it okay to have defined and exclusive space? What pronouns work for everyone? Why are bathrooms locations for conflict? Who has more power? Maybe there really isn’t a Queer movement just a lot of marginalized, oppressed people trying to find our way out of the shadows; which is fine too. I’m up for a good conversation over tea (or not) about what we know and what we don’t know just like Leslie and I had two decades ago. Disagreement should be the paving stones we touch as we make a path not the explosives that blow us apart. Leslie has many legacies, we’ll keep encountering them through the generations; a group like LGBT Allyship is one of them. I used a quote from Chief SiAtle as the framework from my keynote: “Human kind has not woven the web of life. We are but one thread within it. Whatever we do to the web, we do to ourselves. All things are bound together. All things connect.” Thanks Leslie for stopping here with us for a while. Wow, thank you for these kind words! 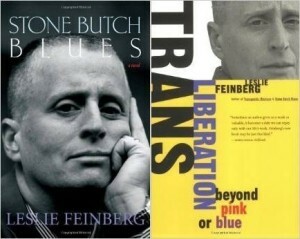 We were inspired by your presence with us in September and I’m so flattered you’re connecting our work with Leslie Feinbergs – a longtime hero for many of us.